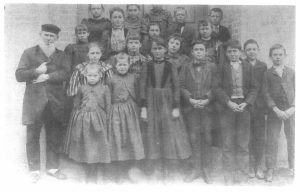 On March 4, 1883, the first German Lutheran services in Austin were held. The congregation organized three months after the initial service with 20 German families represented. The congregation selected as its name, Deutsche Evangelische Lutherische St. Martin’s Kirche in celebration of the 400th birthday of Martin Luther, naming itself after the namesake of Martin Luther – Saint Martin of Tours. 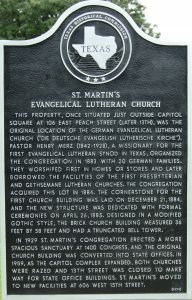 In 1920, the name was changed to St. Martin’s Evangelical Lutheran Church. St. Martin’s congregation laid the cornerstone of its first church at 106 Peach Street on December 21, 1884. At this time the congregation consisted of 50 confirmed members with approximately 75 children enrolled in Sunday School. Coincidentally, this date was three months prior to the laying of the cornerstone for the present state capitol building two blocks to the south. In 1926, the State was expanding its capitol complex and required the church site on 13th Street. The congregation selected a site on 14th Street. The new white stone Gothic structure at 14th and Congress was dedicated on April 28, 1929. The roll of the congregation’s membership listed 432 active members. In November 1957, the congregation agreed to sell the 14th Street property as the state capitol complex dictated another congregational move. A new site at 15th and Rio Grande was purchased. The Romanesque edifice at 606 West 15th Street was dedicated on March 27, 1960. The church’s vaulted roof, ornamental brick patterns and integral use of sculpture combine to express the glory of the church as an instrument of God. Above the triple-arched canopy over the doors, a figure of Christ seems to float, to beckon all, “Come unto Me.” Groups of angels complete the composition, which was executed in cast stone by Charles Umlauf, a well-known Austin sculptor. St. Martin’s Lutheran School provides a nurturing Christian environment for families as a ministry of St. Martin’s Evangelical Lutheran Church. It is the school’s goal for the children to grow spiritually, morally, academically, culturally, socially and physically while helping them to mature in Christ. St. Martin’s is now well into its second century. What began in the tiny building near the new state capitol has grown to a congregation of over 1,000 members. On any given day at St. Martin’s, the facilities accommodate numerous bustling activities by children, church members, volunteers, visitors, and staff.